It's been 150 years since Louis Pasteur perfected the process that bears his name. Pasteurization was at first used to extend the shelf life of beer and wine, but dairy processors soon saw its value and pasteurization became an industry-wide practice. Many dairy farmers currently pasteurize the waste milk they feed to their baby calves. But the process of heating and holding milk at a particular temperature can be both energy and time-consuming. Errors can result in a product that has a burnt flavor or milk that still contains unacceptable levels of bacteria. Recent developments have moved milk purification into the 21st century, with new tools that kill bacteria with ultraviolet light. Mike Hulstein and his family milk 500 head on their farm located near Edgerton, Minn. Hulstein had an ultraviolet milk purifier installed on their dairy a year and a half ago. "We were having a lot of problems with clostridia when we were feeding milk replacer," Hulstein said. "That was all but eliminated after we switched over to feeding UV purified milk." With an average of 40 to 60 baby calves to feed at any one time, Hulstein was spending $100 per day for milk replacer. "We were throwing away up to 600 pounds of waste milk each day," Hulstein said. "Putting in a UV purifying system that would enable us to feed our waste milk seemed like a good solution for both problems." After a year and a half of use, Hulstein reports that his UV milk purifier has been operating trouble-free. "We had some issues with curdling in the beginning," he said. "After about a week, we figured out that we needed to hold the waste milk at 50 degrees or less. We installed a separate cooler to hold our waste milk and that solved the problem." The Hulsteins house their baby calves in a converted tiestall barn. Sue, Mike's wife, handles the bulk of the calf feeding. "Sue really likes our UV milk purifying system," Hulstein said. "Using purified waste milk has simplified calf feeding chores for her. She used to spend a lot of time and effort measuring and mixing milk replacer. 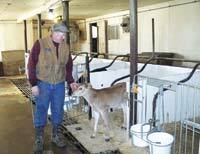 Now, when it's time to feed calves, the milk has been purified and is being held at the proper feeding temperature." Hulstein said not only are their calves healthier, but they also have heavier weaning weights. "We have a lot less scours now and fewer problems with mycoplasma," he said. "Plus, we are making good use of the milk from cows that have been treated and milk from cows that have high somatic cell counts." Ultraviolet light is deadly to most microbes. In a UV milk purifier, milk is passed multiple times over a set of florescent tubes that produce a specific wavelength of UV light. The milk is never heated above feeding temperature, which helps preserve the milk's beneficial immunoglobulins. Proteins and vitamins in the milk are unaffected by the UV purification process. Greg Moes of MoDak Dairy is another dairy producer who has switched from milk replacer to UV purified milk for their calves. Moes and his family milk 1,750 head on their farm located near Goodwin, S.D. At any one time, Moes will have an average of 250 baby calves on their place. "We put in our UV milk purifier last June," Moes said. "We had already spent $80,000 on milk replacer by then and were on track to spend well over $100,000 for milk replacer by year's end." Moes has noted some stark differences between raising calves on UV purified milk versus milk replacer. "We hardly ever treat calves now," he said. "Since the first of June, we have lost only three calves out of the 600 to 700 head that we have run through the system. When we were feeding milk replacer, our baby calf death loss was running at about five percent." One certain sign of increased baby calf health at MoDak Dairy is the fact that they haven't purchased any electrolytes since installing their UV milk purifier. "We now go 10 days or more without treating any calves at all," Moes said. "Clostridiosis was a huge problem for us, but it's now nonexistent. And we always fought the seven to 14 days scours. We simply don't have that anymore." Moes purchased an old 400 gallon milk tank to hold and chill the milk that will be used to feed their baby calves. "The UV purifier has been very reliable," he said. "I like that it's so simple to operate. Anyone can run it. All of its functions are automatic." During the first few months of its operation, Moes ran weekly tests to verify that their UV milk purifier was doing its job. "Every test has come back negative," Moes said. "We would test the milk before and after it went through the UV purifier. It took care of everything, including E. coli and strep. Some of our milk samples [before being run through the purifier] had bacteria counts of 300,000 to 400,000. These levels were reduced to less than 1,000 by the UV purifier." Healthier calves along with less time and money spent on treating sick animals has by no means been the only benefit Moes has seen. "We are weaning calves that are 25 to 30 pounds heavier than when we were feeding milk replacer," he said. "Our calves are doubling their birth weights in eight to 10 weeks. We couldn't do that before. Our calf grower noticed the difference right away. Our calves now have an average weight of 275 to 280 pounds at 10 to 12 weeks of age." There are some days when Moes doesn't have enough waste milk to feed all their baby calves. On such days, he doesn't hesitate to pull additional milk from their main cooler. "I know that it's salable milk," he said. "But the health benefits alone more than make up for the cost. We can see the difference in the calves." With their radically reduced baby calf mortality, Moes thinks that MoDak Dairy may soon be grappling with a new set of problems. "We don't know what we're going to do with all the extra heifers," he said. "One option might be to cull the milking herd harder. We can also be more selective about which heifers we breed. Maybe we'll simply put some of them into the feedlot and sell them as beef animals. "In any case, it certainly is a good problem to have."